With 228 destinations across 74 countries and 46 million passengers a year, London Gatwick is the second largest airport in the UK, with a stated aim to compete and grow to become London's airport of choice. In order to achieve this, Gatwick is continuously working towards providing passengers with great service every day. In addition to making the check in and security processes faster, Gatwick is also committed to improving the retail experience within the terminals. One of the changes the airport has implemented was the introduction of Gatwick Direct. 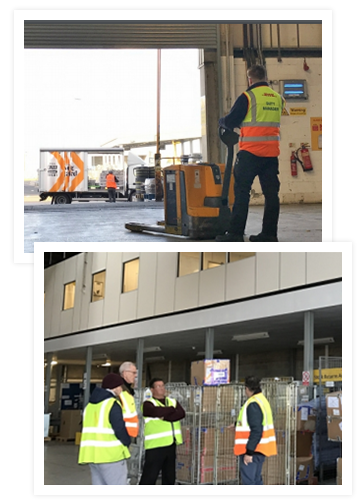 Working in conjunction with its logistics supplier DHL, the airport now consolidates over 90% of airside deliveries at a landside logistics centre. This allows them to supply the airport stores with the right products at the right time and limit the number of deliveries entering restricted spaces. The challenge of delivering goods to the right place at the right time within a multivendor location was one that DHL tackled in conjunction with Panasonic Business. Panasonic delivered the software solution that manages the process. Gateway was designed and implemented with passengers safety and convenience at its heart. The Gateway solution matches the demand for - and restrictions on - deliveries in airports, urban centres and larger shopping complexes. Consolidating these deliveries provides secure supply-chain management, along with end-to-end visibility and real-time goods tracking. So goods flow smoothly and efficiently from multiple suppliers to multi-vendor sites, increasing the efficiency, accuracy and management of the process. "We need to be aware of every person and every product that enters the site. Tracking our goods is more efficient thanks to the system. No one can get through our door without a unique reference number," says Claire Blakemore, General Manager of the Gatwick Logistics Consolidation Centre. "It gives us a complete track and trace of all media that comes through the door and provides retailers with the visibility of where their items are." An online portal enables the supplier to book and manage delivery slots. The supplier then receives a receipt and the request is processed by Customer Service. The order arrives at the consolidation centre where it is identified by the licence plate number of the delivery vehicle. "It gives us a complete track and trace of all deliveries that come through the door and provides retailers with the visibility of where their items are." The delivery is scanned and signed for. Once the security screening is complete, the goods can be offloaded at the Airport, where the order is received by the retailer. Throughout the whole process the supplier can track and trace the delivery. The capability to track the products throughout Gatwick Airport ensures security levels within the airport are maintained and it complies with stringent security regulations. Additionally, 24 hours free storage gives suppliers the flexibility to drop off the goods at the most convenient time. They can then call down the stock at a time that suits their needs. "What's also important is that the Gateway system syncs with our accounting software, so that we are able to bill all of the suppliers extremely accurately using the data that's in the system," adds Claire Blakemore. "Tracking orders enhances customer experience, it enables customers to find at the airport stores products they need at a certain time." The main benefit of the system is the security aspect. Since the implementation, there has been a 100% security compliance month on month. "It has never failed us," explains Claire Blakemore. "I've never had any concerns that someone could be getting onto my site, know the person who is coming in, I know what company he comes from, I know the driver's details. "What's more, tracking orders enhances the customer experience, it enables customers to find the products that they want at their favourite stores within the airport." Implementing the solution led to a 2.13% increase in customer satisfaction within three months.